Creation: Appeared February 15, 2012 (CTB) as an upgrade to SR 3000. Ran as it does today. There is a gap in the route of about 500 ft. between Hastings Dr and Liberia Ave/Wellington Rd where the Prince William Pkwy is technically inside the City of Manassas. This is the 2nd VA 294. VA 294 is 6+ lanes from SR 640 Minnieville Rd to I-95. Posting: VA 294 postings began appearing in late July 2012. Legislative names: Kathleen K. Seefeldt Parkway, entire route (4-5-00 designation predates VA 294 designation). Comments: The Prince William Parkway was built to provide a direct way to cross Prince William County, as there are few roads that actually do this. 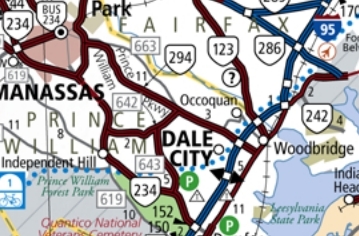 By the late 1990s it was complete from I-95 to Liberia Ave in Manassas, with the segment between Hoadly Rd and Manassas (several miles) rural and posted with a 55 mph speed limit. This segment is also posted with kilometer posts. VA 294 #1: Appeared Oct 1935 (CTB) as a renumbering of part of VA 12. 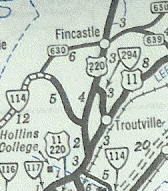 Ran from US 11 Troutdale to the rerouted VA 12 (now US 220) Trinity. VA 294 was downgraded to SR 670 in September 1942 (CTB Minutes).